The Nissan Z cars have always been fun little coupes with enormous potential, but this 280Z makes it easy to see what that potential is. Sleek, flowing lines, with the front reminiscent of the Jaguar E-type and the rear reminiscent of, dare I say it, the Porsche 911, with its ducktail spoiler, the original Z has always stood out as a beauty. Originally introduced in 1969 as the Fairlady Z in Japan, and then later introduced to the rest of the world as the 240Z, then the 260Z, and then the 280Z, the car known by the internal production code of S30 was sold until 1978. The Z was the first car in the United States that was really able to break Americans' stereotype of Japanese cars as frugal little econoboxes, and for good reason. The Z is lightweight, with a front-mounted engine and what power it did have going through the blacked-out back wheels. 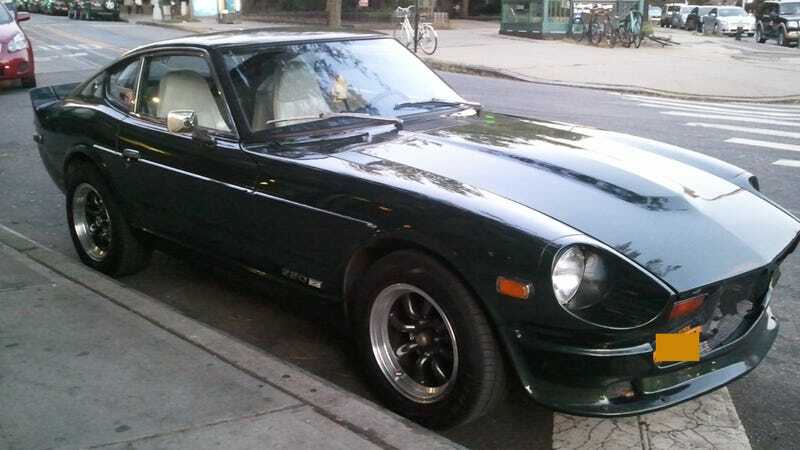 The 280Z, pictured here, had an inline six cylinder engine pumping out 170 horsepowers by the time it went out of production, which was a lot back then and is still not too shabby today seeing as the car only weighed 2,875 pounds. All of that style and grunt made the Z good as a race car, with Paul Newman even getting behind the wheel of one with Bob Sharp Racing. What the Z is possibly best known for today, though, is how willingly it accepts modifications. Bigger, newer, RB-series engine swaps, even Chevy small block V8s have found their way into the hoods of many a Z. It's unknown if this one had anything extra cooking under the hood, but as it is already it's a car in great condition. The bodywork is all straight, the paint is somehow all in one piece, and even that white leather (pleather?) interior looks to be in good nick. If you excuse the torn up seats, that is. And I could. Hell, a car from 1978 that looks this good, isn't the size of a Nimitz-class aircraft carrier, and it's still fun to drive? I'd take that any day of the week.